Just in case I don’t find any solid color sock yarn for today’s class, I bought this Lion Brand sock yarn at Beverly’s with a 40% off coupon. It is divided and ready to go. 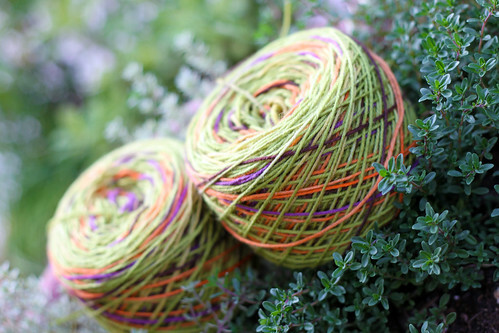 For anyone interested, I will explain my method to evenly divide a skein of variegated yarn. First I have an inexpensive kitchen scale that switches between grams and oz. I use the gram setting. Then I put the skein on the scale and start winding a new ball with my trusty Royal ball winder. When the measurement on the scale is half the amount that I started with, I stop. Now it gets a little tricky and tangly if I am not careful. I remove the skein from the ball winder and take the thread coming from the center of the ball. I lay this strand against the yarn coming from the outside of the ball which is still connected to the rest of the yarn on the scale. I carefully match the pattern on both strands. Sometimes it matches in a couple of feet, other times I have to either unwind from the outside of the ball just made or pull more yarn from the center of the ball on the scale. After I get both strands matching I decide a good place to separate the balls. I check each ball back on the scale just to be sure they are the same weight. I cut through both strands. I think it is sometimes better to loose a little yarn from the beginning of the first ball. This keeps the weight of both balls more even. Since the beginnings of both balls are cut at the same time they are ready to go. This works if you are knitting two strands of a hand painted yarn together too. I like to do this so the colors stay pure. I took the photo in the evening with the new camera and no flash. I really like this camera. Now I just need more time to play with it. This entry was posted on Sunday, May 3rd, 2009 at 3:00 am and is filed under Knitting. Tagged: Knitting. You can feed this entry. You can leave a response, or trackback from your own site. The thread looks cute amongst the greenery!